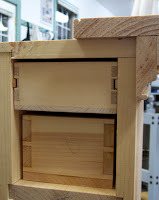 If you want to add the ultimate secret drawer to a piece of furniture, construct it so that even YOU can't reveal its contents! 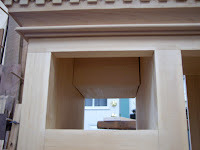 While working on the PA German Hanging Cupboard, whose photo is shown in the sidebar, I decided to add a hidden drawer above one of the top two drawers, since both had so much empty space above them inside the cupboard. Carefully measuring for size from the back of the cupboard (since I hadn't yet added the boards for the back) I painstakingly handcut the dovetailed secret drawer, handcut dadoes for drawer runners, installed the runners so the hidden drawer wou ld hang suspended above the top drawer, and inserted the drawer (still working from the back of the cupboard). 1) View from the back of the cupboard. The secret drawer rests on drawer runners above the top drawer. 3) View from the front of the cupboard with secret drawer in place and top drawer removed.